Generations of kids love Sesame Street, the long-running television show for pre-schoolers. What fun, then, to visit a Pennsylvania theme park designed for little kids and have the chance to meet beloved characters such as Big Bird, Elmo, and Cookie Monster. The ideal age for kids is 2 to 7. The 14-acre Sesame Place is located in Langhorne, Pennsylvania, a 30-minute drive north of Philadelphia. Sesame Place is a fair-weather theme park, opening in early May and wrapping up in October after the annual Count's Halloween Spooktacular event. Sesame Place also holds special celebrations on Memorial Day and the Fourth of July. The first thing to know is that Sesame Place has a water park area with a good number of wet rides and waterslide attractions, so bring your bathing suits. Many kids wear bathing suits all day. 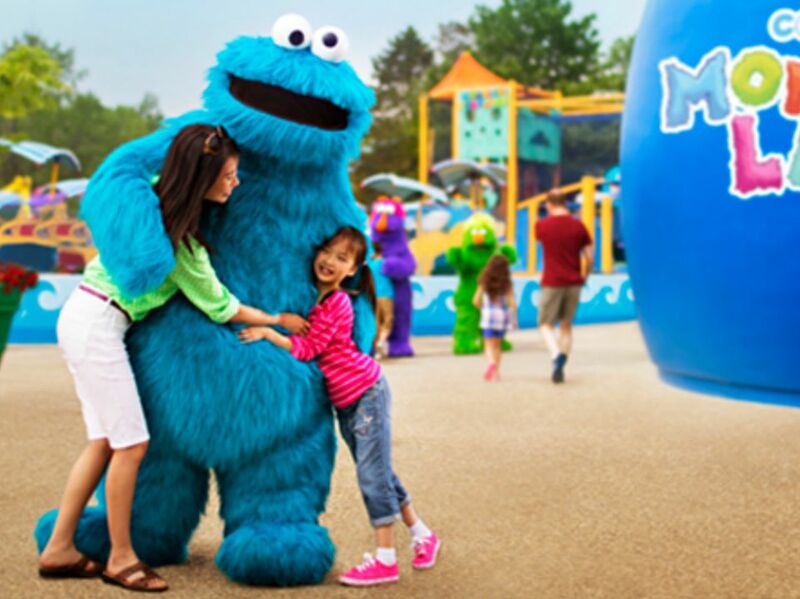 There are also over two dozen dry attractions, including Cookie's Monster Land, which opened in 2014. The newest land in the park features attractions and play areas that families can enjoy together, including Captain Cookie’s High "C’s" Adventure, Oscar’s Rotten Rusty Rockets, The Honker Dinger Derby, Flying Cookie Jars and the Monster Mix-Up. In addition to rides, Cookie's Monster Land features a new monster-themed climbing area called Monster Clubhouse, where kids and parents can climb and explore together on the three-story colorful net climb. For kids 5 and under, the Mini Monster Clubhouse is a soft play area where little ones can jump, climb, crawl and play. Families can enjoy live shows with audience interaction, and musical parades with favorite characters. There are many opportunities to meet with Sesame Street characters live at the theme park, from Elmo and Big Bird to Barkley the dog. You can book a dining experience where Sesame Street characters come by to say hello. Sesame Place offers character meals (with big buffets) at breakfast, lunch, and dinner. Halloween is a major event at Sesame Place. The fun starts on weekends in late September, with special shows, trick-or-treating, hayrides, an annual costume contest, and more. Heading to Sesame Place? These articles can help you plan a trip that's less expensive and more fun. Be sure to investigate discounted ticket options. Download the free Sesame Place app to get real-time information about the park, including exclusive offers and deals, daily show times, an interactive park map, and more. There are many ways to save money when you visit theme parks, from buying tickets in advance and online to avoid weekends. These strategies hold true at Sesame Place, too. Also, be sure to look for seasonal specials. Bring your own lunch and take a break in the picnic area. If you live within driving distance, consider buying an annual pass if you want to visit twice or more in one year.